The index opened flat and stayed within a narrow range of 42 points for the entire session of trade and closed just positive at 7329.65, a small gain of 11.65 points. The broader market was positive, with 1045 advances to 525 declines. Expected range on Expiry seems to be 7200-7400. 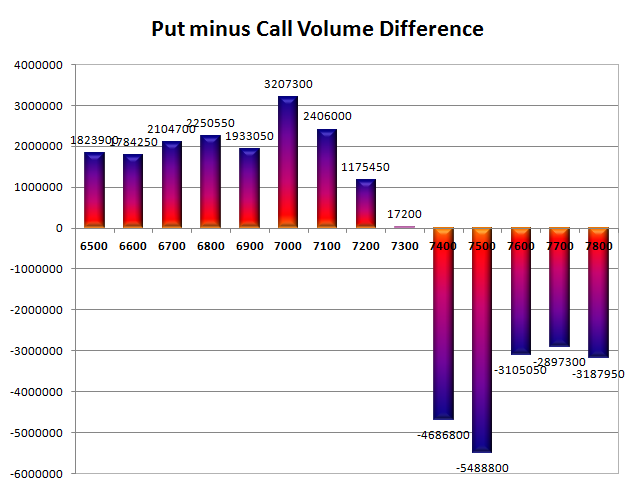 Call option 7300 added 3.98 lacs huge amount of OI with profit booking seen at 7500 and above strike prices. Put option 7300-7200 added 9.98 lacs huge amount of OI with short covering seen at 7400 and above strike prices. Nifty Open Interest is at 1,45,98,350 down by 20,37,300, whereas June series added 24.93 lacs with decrease in price, 100% rollover with some more long addition. Bank Nifty Open Interest is at 27,13,450 down by 20,775, whereas June series added 6.83 lacs with increase in price, 100% rollover with huge long build-up in next series. FII’s bought huge 9.66 lacs Futures, mostly long build-up as their net OI increased by 50071 contracts (includes 179002 longs to 159685 shorts for the day) and the average price per contract comes to around 7384.17. FII’s future open contract as on date is 581566. PCR Open Interest (Volume) is at 0.934. 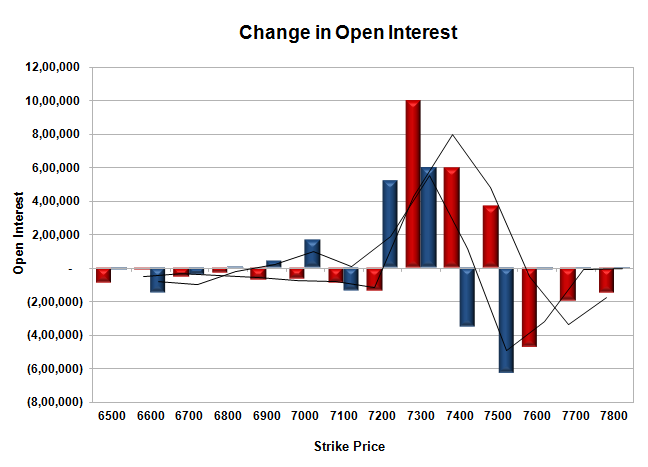 Initial support at 7300, with OI of 36.80 and below that at 7200 with OI of 34.39 lacs. 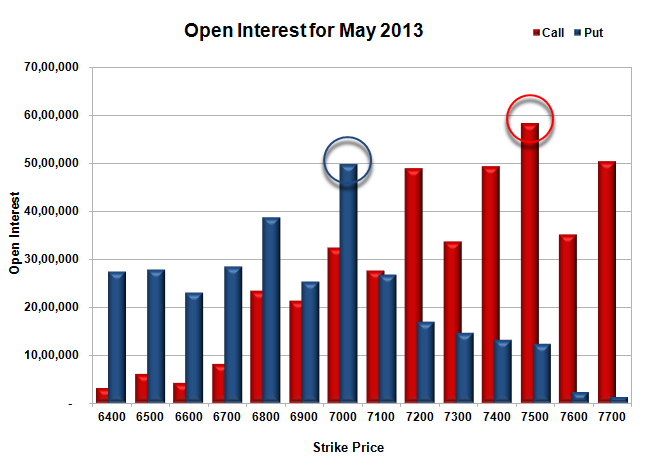 Initial and best resistance at 7400 with OI of 60.12 lacs and above that at 7500 with highest OI of 61.01 lacs. Day Range as per Option Table is 7242 - 7412 and as per VIX is 7262 - 7397 with 7326 as the Pivot. The index opened flat but saw selling pressure with the index making lows of the day around 7275. Intermittent buying saw the index close above the psychological level of 7300 at 7318.00, still a huge loss of 41.05 points. The broader market was also negative, with 593 advances to 977 declines. Expected range till Expiry seems to be 7000-7500. Call option 7300-7500 added 19.61 lacs huge amount of OI with profit booking seen at 7600 and above strike prices. 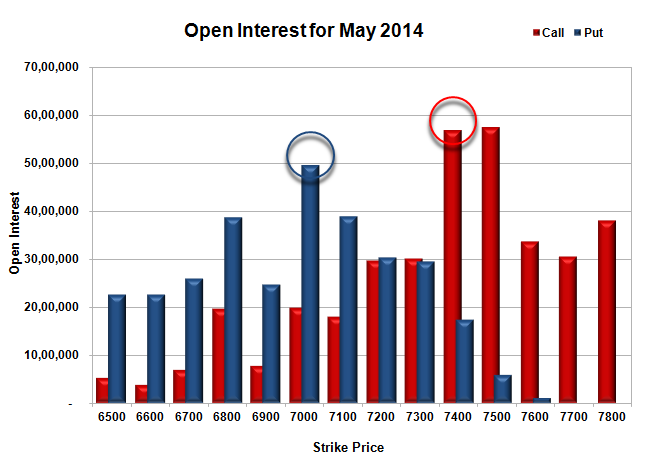 Put option 7300-7200 added 11.14 lacs huge amount of OI with short covering seen at 7400 and above strike prices. Nifty Open Interest is at 1,66,35,650 down by 25,11,250, whereas June series added 20.40 lacs with decrease in price, mostly rollover with some long liquidation. Bank Nifty Open Interest is at 27,34,225 up by 45,200, whereas June series added 6.96 lacs with decrease in price, mostly short build-up in both series. FII’s bought just 0.09 lacs Futures, mostly long build-up as their net OI increased by 4133 contracts (includes 145352 longs to 145165 shorts for the day) and the average price per contract comes to around 7361.83. FII’s future open contract as on date is 531495. PCR Open Interest (Volume) is at 0.875. 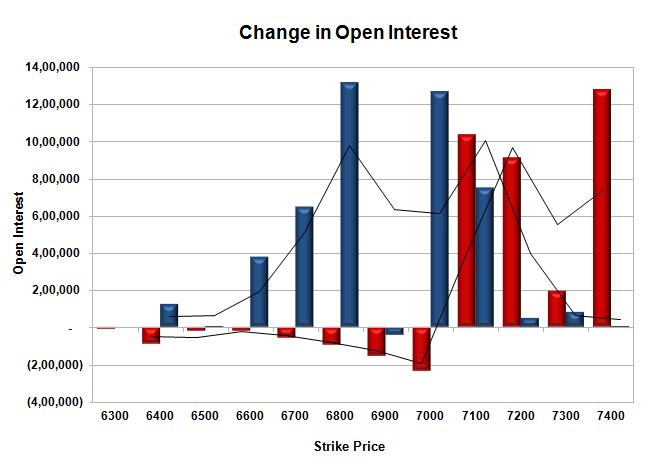 Initial support at 7200, with OI of 31.69 and below that at 7000 with OI of 47.53 lacs. Initial and good resistance at 7400 with OI of 56.15 lacs and above that at 7500 with highest OI of 67.69 lacs. 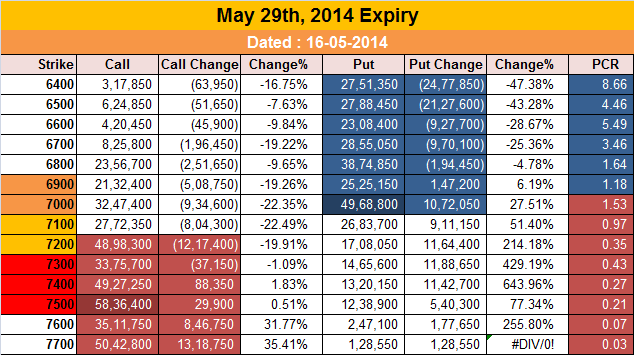 Nifty Spot Day Range as per Option Table is 7226 - 7412 and as per VIX is 7245 - 7391 with 7322 as the Pivot. The index opened positive and saw buying interest from the morning, with every dip being bought. The index went on to close near the highs of the day at 7367.10, a huge gain of 90.70 points. On a week on week basis the index gained 164.10 points or approx 2.28%. The broader market was highly positive, with 1138 advances to 447 declines. Expected range till Expiry seems to be 7000-7500. 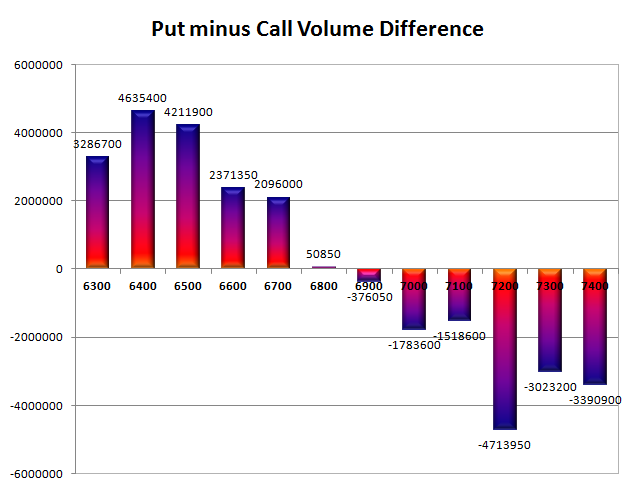 Call option 7600 added 6.70 lacs huge amount of OI with short covering seen at 7300 and lower strike prices. Put option 7400-7300 added 17.82 lacs huge amount of OI with profit booking seen at 7100 and lower strike prices. 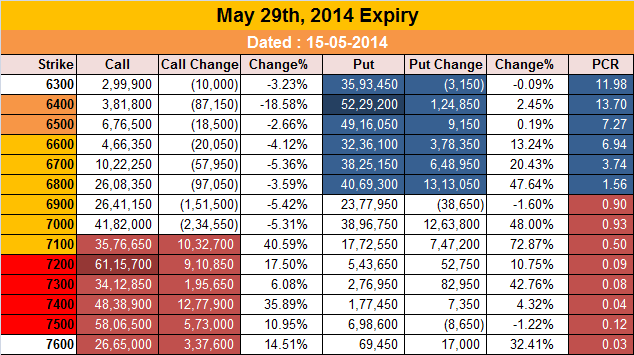 Nifty Open Interest is at 2,10,26,000 down by 1,23,500, with increase in price, most probably short covering. 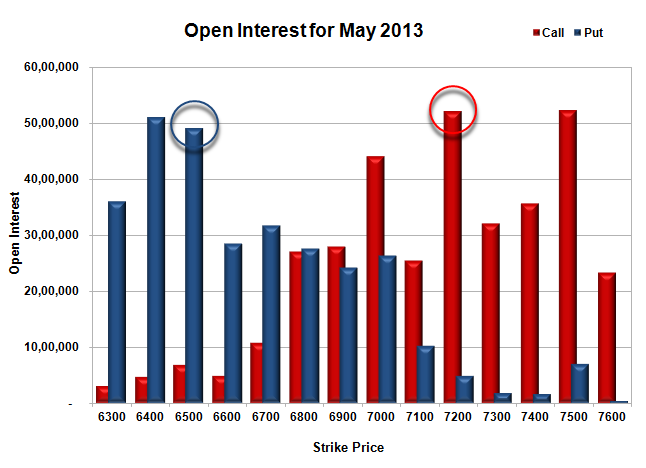 Bank Nifty Open Interest is at 29,11,450 up by 22,075, with increase in price, most probably long build-up. FII’s sold huge 6.01 lacs Futures, mostly short build-up as their net OI increased by 20401 contracts (includes 88570 longs to 100599 shorts for the day) and the average price per contract comes to around 7421.29. FII’s future open contract as on date is 532001. PCR Open Interest (Volume) is up again and now at 0.912. 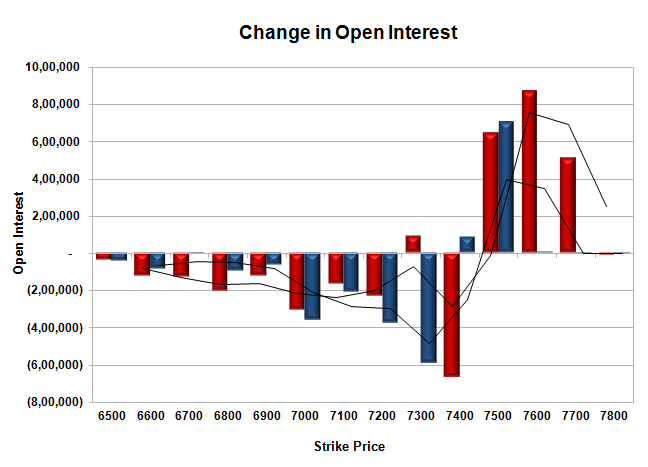 Initial support now up at 7300, with OI addition of 8.40 lacs for the day and below that at 7200 with OI of 30.27 lacs. 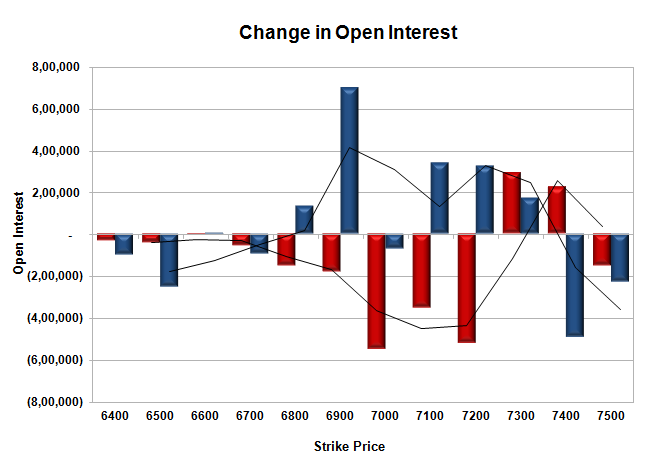 Initial and superb resistance at 7400 with OI of 56.87 lacs and above that at 7500 with highest OI of 57.53 lacs. 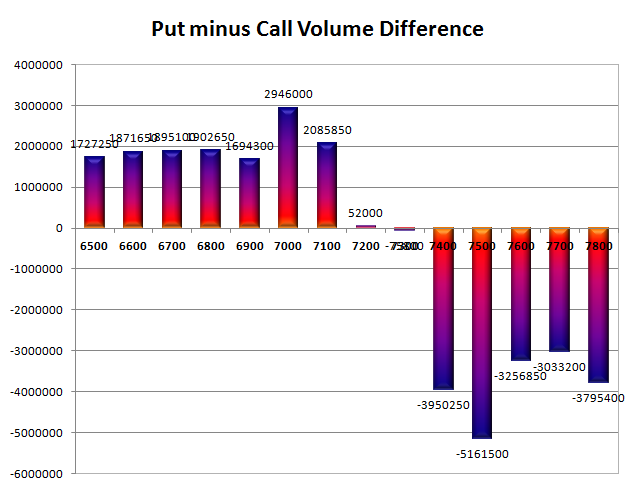 Day Range as per Option Table is 7267 - 7435 and as per VIX is 7299 - 7435 with 7347 as the Pivot. The index opened flat, but profit booking from higher levels saw the index dip towards the lows at 7207. Buying support at lower levels saw the index bounce back towards the previous days close but closed in the red at 7252.90, small loss of 22.60 points. The broader market though was highly positive, with 1113 advances to 452 declines. Expected range till Expiry seems to be 7000-7500. Call option 7100-7500 added 11.39 lacs huge amount of OI with profit booking seen at 7600 and above strike prices. Put option 7300-7000 added 19.11 lacs huge amount of OI with profit booking seen at 6900 and lower strike prices. 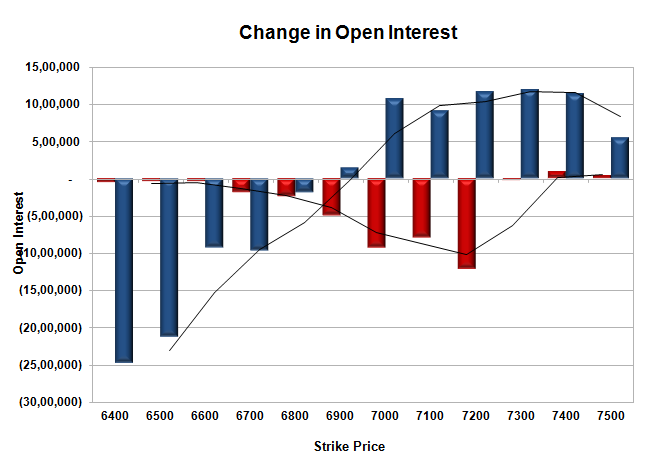 Nifty Open Interest is at 2,21,29,200 up by 5,03,700, with small decrease in price, most probably long/short build-up. Bank Nifty Open Interest is at 28,31,025 down by 42,675, with decrease in price, most probably long liquidation. FII’s bought huge 3.59 lacs Futures, mostly long build-up as their net OI increased by 25502 contracts (includes 79231 longs to 72045 shorts for the day) and the average price per contract comes to around 7310.84. FII’s future open contract as on date is 497407. PCR Open Interest (Volume) is at 0.842. Initial support at 7200, with huge addition of 8.84 lacs for the day and below that at 7000 with huge OI of 52.02 lacs. 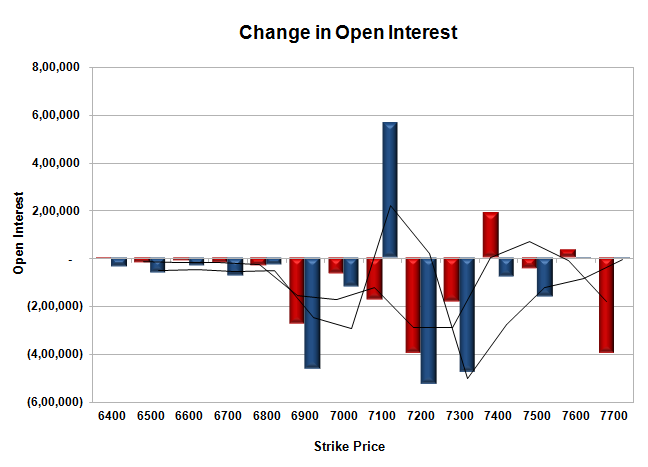 Initial resistance still at 7300 with OI of 40.36 lacs and above that at 7500 with highest OI of 60.04 lacs. Day Range as per Option Table is 7157 - 7341 and as per VIX is 7185 - 7321 with 7249 as the Pivot. The index opened up for the third day in a row and moved up to touch the high at 7320, though profit booking took the shine out of the index and it closed flat at 7275.50, small gain of 11.95 points. The broader market though was highly positive, with 1226 advances to 340 declines. Expected range till Expiry seems to be 7000-7500. 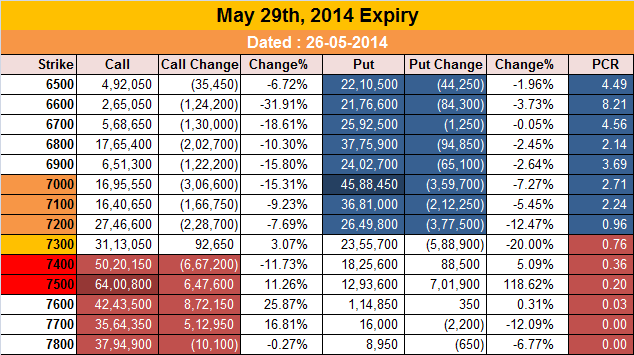 Call option 7400-7600 added 5.29 lacs huge amount of OI with short covering seen at 7200 and lower strike prices. Put option 7300-7100 added 15.60 lacs huge amount of OI with profit booking seen at 6700 and lower strike prices. 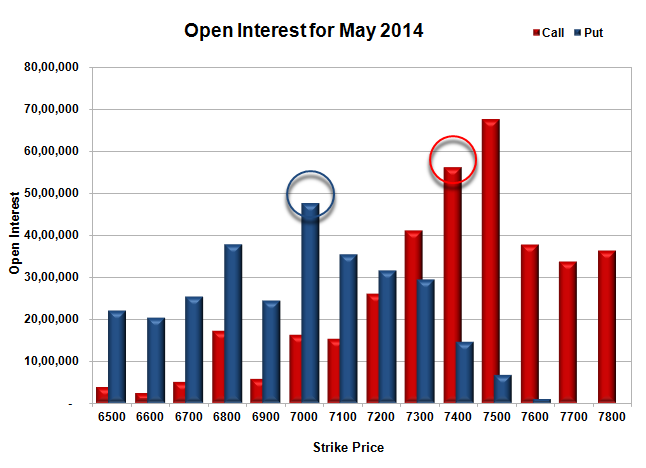 Nifty Open Interest is at 2,16,25,500 down by 2,83,900, with small increase in price, most probably short covering. 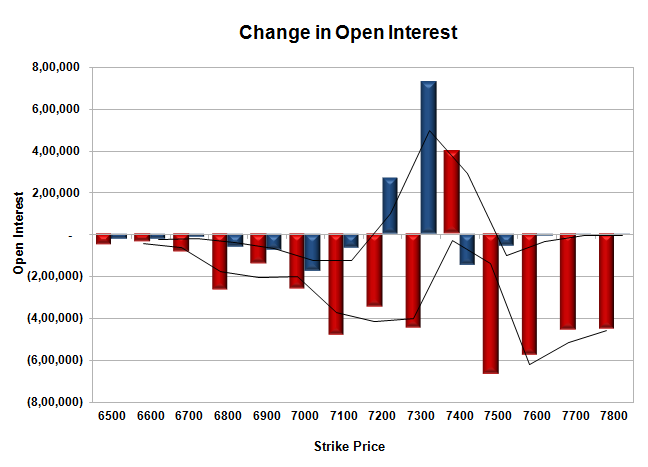 Bank Nifty Open Interest is at 28,73,700 up by 1,71,050, with decrease in price, most probably short build-up. FII’s bought huge 8.73 lacs Futures, mostly long build-up as their net OI increased by 18219 contracts (includes 81451 longs to 63982 shorts for the day) and the average price per contract comes to around 7343.04. FII’s future open contract as on date is 471905. PCR Open Interest (Volume) is moving higher and now at 0.811. Initial support at 7200, with huge addition of 6.85 lacs for the day and below that at 7000 with huge OI of 47.78 lacs. 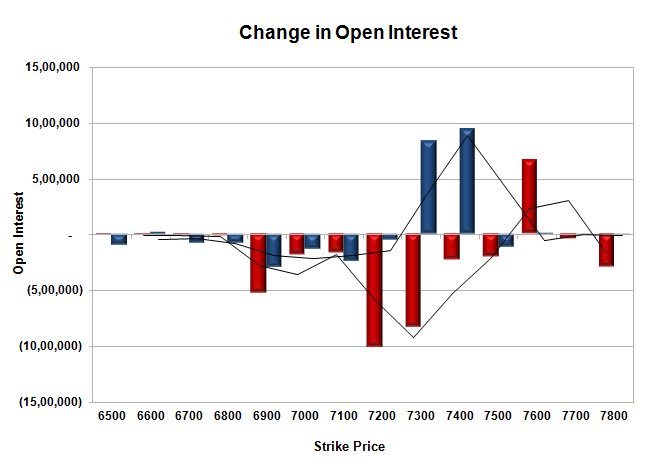 Initial resistance still at 7300 with OI of 36.85 lacs and above that at 7500 with highest OI of 58.50 lacs. 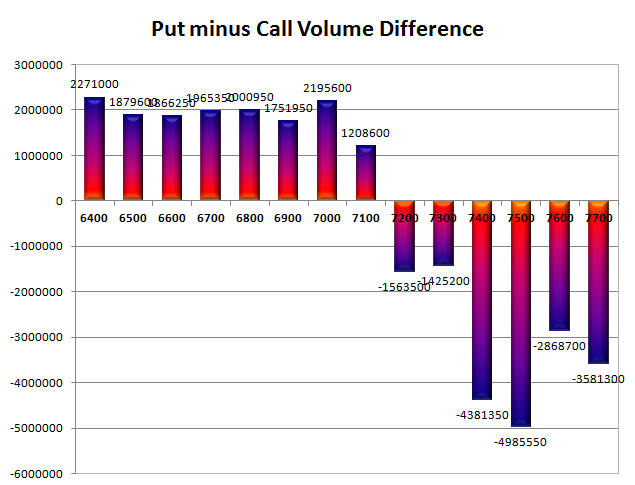 Day Range as per Option Table is 7188 - 7384 and as per VIX is 7202 - 7349 with 7292 as the Pivot. The index opened up by 74 points on the back of good global cues and better than expected election results, but saw profit booking to the lows of the day at 7193. The responsive buyers came back to move the index again back to the highs of the day at 7291 but closed just lower at 7263.55, huge gain of 60.55 points. The broader market was highly positive, with 1285 advances to 269 declines. Expected range till Expiry seems to be 7000-7500. Call option 7300-7400 added 5.19 lacs huge amount of OI with short covering seen at 7200 and lower strike prices. Put option 7300-6800 added 16.05 lacs huge amount of OI with profit booking seen at 6700 and lower strike prices. 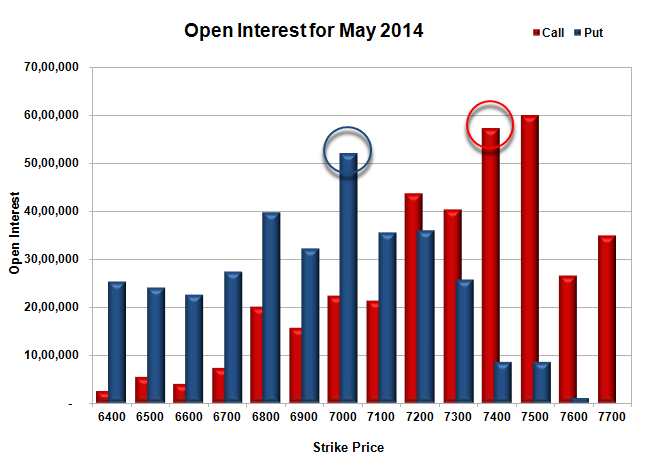 Nifty Open Interest is at 2,19,09,400 up by 3,52,650, with increase in price, most probably huge long build-up. 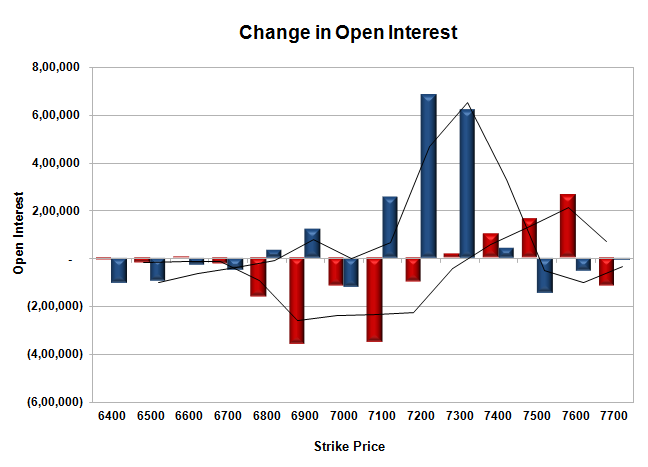 Bank Nifty Open Interest is at 27,02,650 up by 1,58,550, with increase in price, most probably huge long build-up. FII’s bought huge 8.16 lacs Futures, mostly long build-up as their net OI increased by 62651 contracts (includes 110078 longs to 93847 shorts for the day) and the average price per contract comes to around 7326.34. FII’s future open contract as on date is 453686. 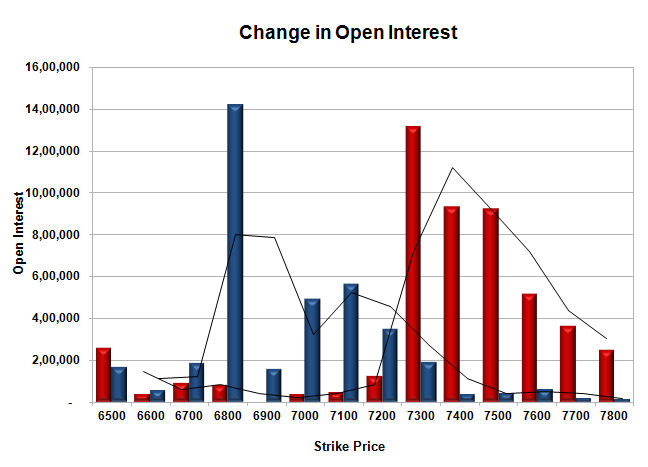 PCR Open Interest (Volume) has moved up a bit at 0.777. Initial support at 7200, with huge addition of 3.27 lacs for the day and below that at 7000 with huge OI of 48.98 lacs. Initial resistance at 7300 with OI of 36.67 lacs and above that at 7500 with highest OI of 56.86 lacs. Day Range as per Option Table is 7148 - 7352 and as per VIX is 7185 - 7342 with 7249 as the Pivot. The index opened up by 147 points on the back of better than expected results coming out in the morning and went up to touch the highs of the day within the first hour of trade to the highs of 7563. Profit booking from thereon took the index to the lows of the day at 7131 but closed up at 7203.00, huge gain of 79.85 points. On a week on week basis the index gained huge 344.20 points or approx 5.02%. The broader market was just positive, with 802 advances to 724 declines. Expected range till Expiry seems to be 6900-7500. 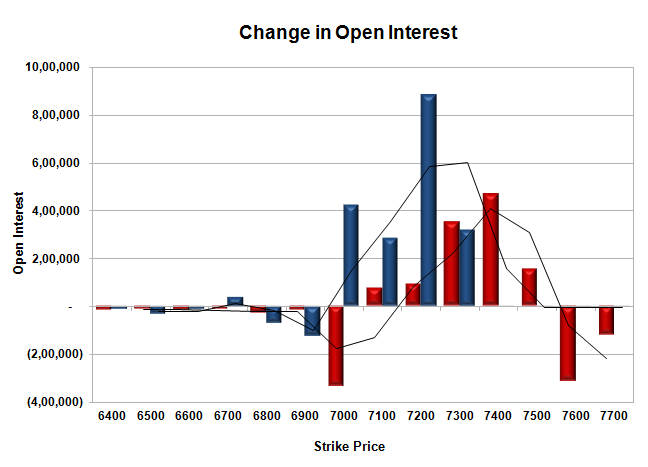 Call option 7400-7700 added 22.84 lacs huge amount of OI with short covering seen at 7200 and lower strike prices. Put option 7700-6900 added 64.73 lacs huge amount of OI with profit booking seen at 6800 and lower strike prices. 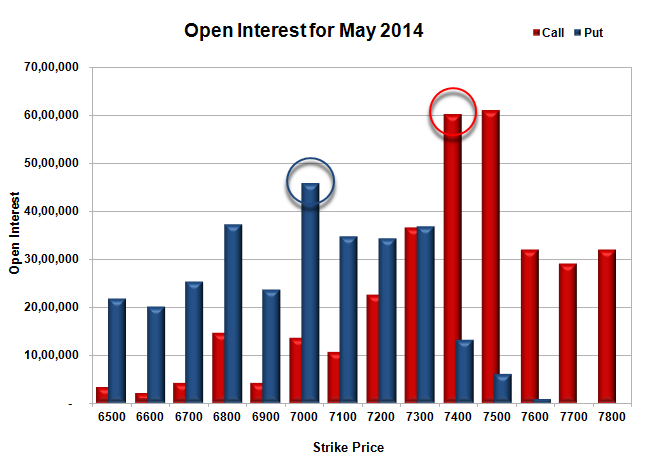 Nifty Open Interest is at 2,15,56,750 up by 36,21,150, with increase in price, most probably huge long build-up. Bank Nifty Open Interest is at 25,44,100 up by 4,03,075, with increase in price, most probably huge long build-up. FII’s sold huge 11.29 lacs Futures, mostly short build-up as their net OI increased by 333 contracts (includes 207808 longs to 230389 shorts for the day) and the average price per contract comes to around 7275.21. FII’s future open contract as on date is 391035. 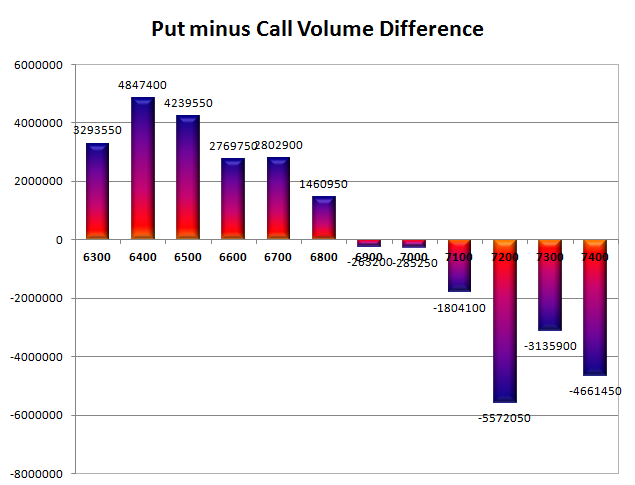 PCR Open Interest (Volume) though moved to 0.735 due to huge profit booking at 6500-6400PE Level. Initial support at 7200, with huge addition of 11.64 lacs for the day and below that at 7000 with huge OI of 49.69 lacs. Initial resistance at 7300 with OI of 33.76 lacs and above that at 7500 with highest OI of 58.36 lacs. Day Range as per Option Table is 7169 - 7377 and as per VIX is 7111 - 7295 with 7299 as the Pivot. Nifty opened flat but went up to touch the highs of the day at 7152 within the first few minutes, but saw the sellers coming back to move the index below the dotted line. A small pullback towards the end saw the index closed just up at 7123.15, a small gain of 14.40 points. The broader market was negative, with 533 advances to 986 declines. Expected range for tomorrow seems to be 6400-7500. 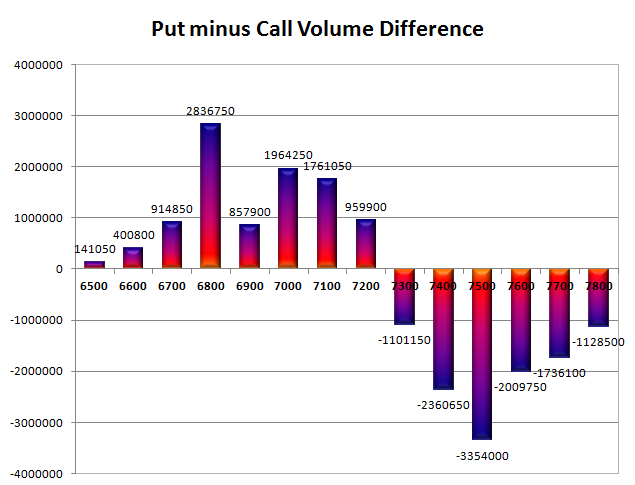 Call option 7100-7600 added 43.28 lacs huge amount of OI with short covering seen at 7000 and lower strike prices. Put option 7100-6400 added 44.47 lacs huge amount of OI with profit booking seen at 6300 and lower strike prices. 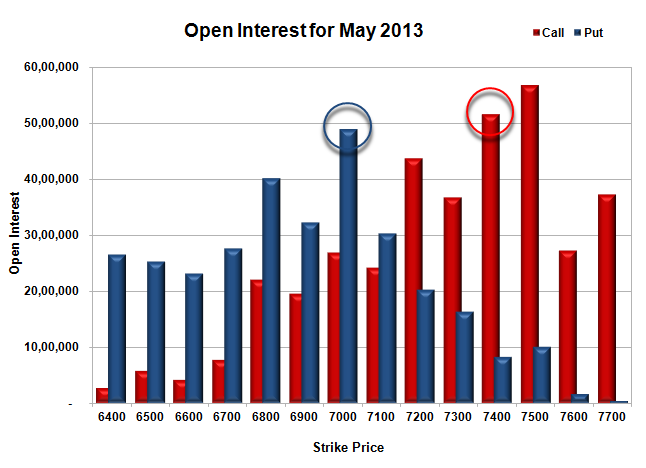 Nifty Open Interest is at 1,79,35,600 up by 9,13,750, with small increase in price, most probably huge long build-up. 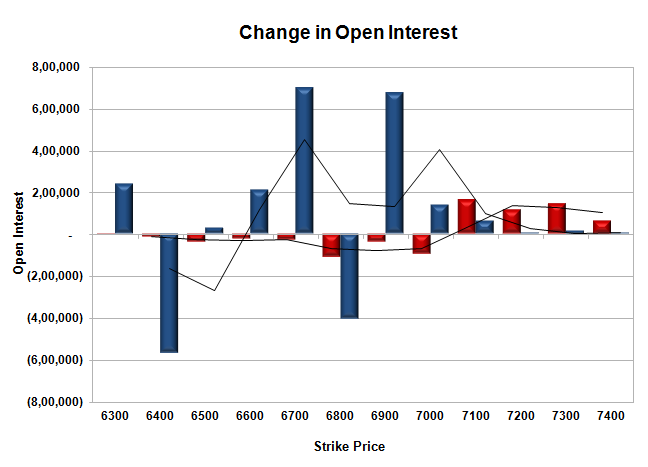 Bank Nifty Open Interest is at 21,41,025 up by 80,375, with increase in price, most probably long build-up. FII’s bought 3.21 lacs Futures, mostly long build-up as their net OI increased by 12272 contracts (includes 71079 longs to 64651 shorts for the day) and the average price per contract comes to around 7143.54. FII’s future open contract as on date is 390702. 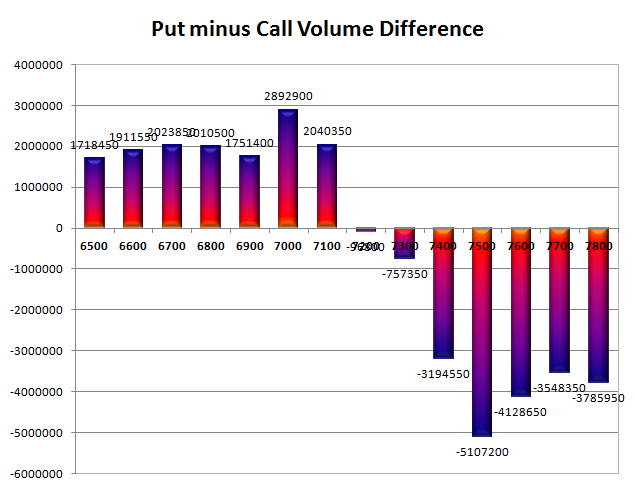 PCR Open Interest (Volume) is at the lowest points just before the big event at 0.812. 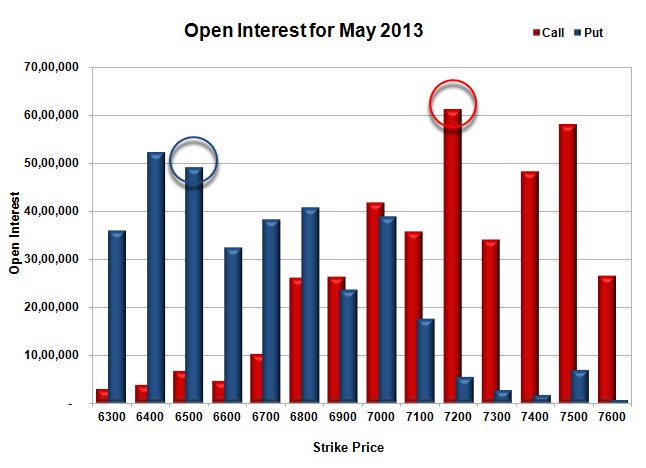 Initial support still at 7000, with OI of 38.97 lacs and below that at 6800 with OI of 40.69 lacs. 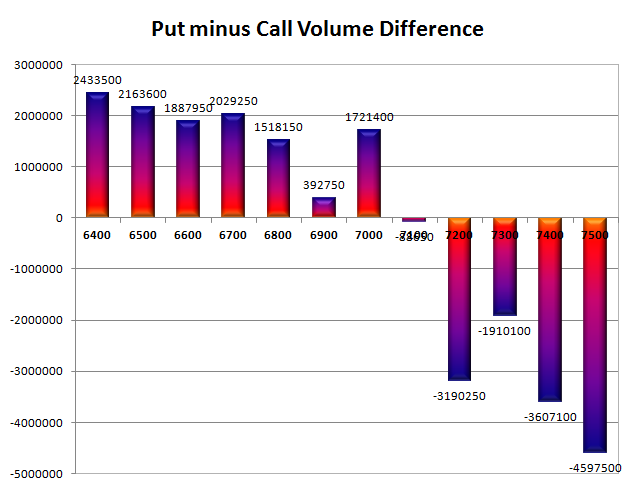 Initial and best resistance at 7200 with huge OI of 61.16 lacs and above that at 7500 with huge OI of 58.07 lacs. 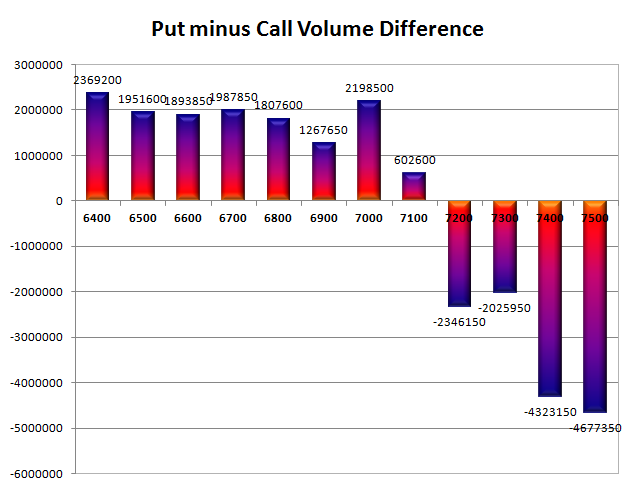 Day Range as per Option Table is 7028 - 7218 and as per VIX is 6986 - 7260 with 7119 as the Pivot. Nifty opened flat and after the initial surge towards the highs of the day around 7142 but the sellers used the opportunity to sell the highs and the index went down to make low of 7080. Nifty ultimately closed the day flat at 7108.75. The broader market was positive, with 965 advances to 553 declines. Expected range till before Election result seems to be 6400-7500. 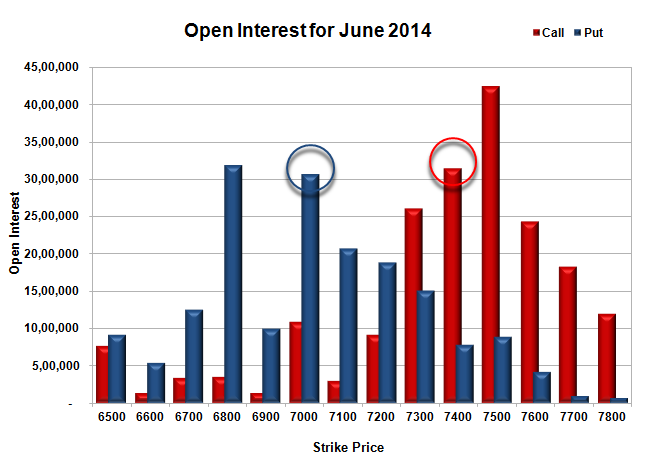 Call option 7100-7600 added 6.71 lacs huge amount of OI with short covering seen at 7000 and lower strike prices. Put option 7100-6900 and 6700-6600 added 17.94 lacs huge amount of OI with profit booking seen at 6800 and 6400 strike prices. Nifty Open Interest is at 1,70,21,850 up by 10,13,100, with no change, most probably huge long/short build-up. 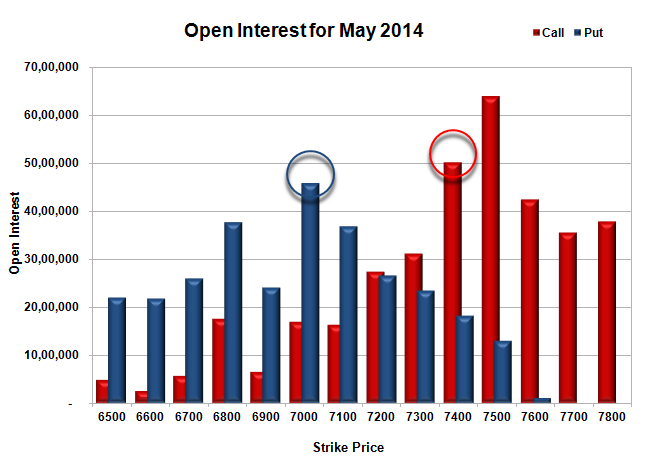 Bank Nifty Open Interest is at 20,60,650 up by 1,54,250, with increase in price, most probably long build-up. FII’s sold huge 1.44 lacs Futures, mostly short build-up as their net OI increased by 21088 contracts (includes 244759 longs to 53724 shorts for the day) and the average price per contract comes to around 7143.26. FII’s future open contract as on date is 378430. 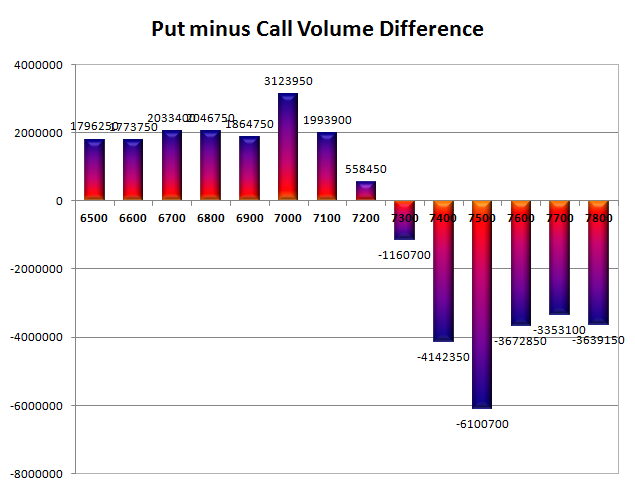 PCR Open Interest (Volume) is still below the danger level at 0.868. 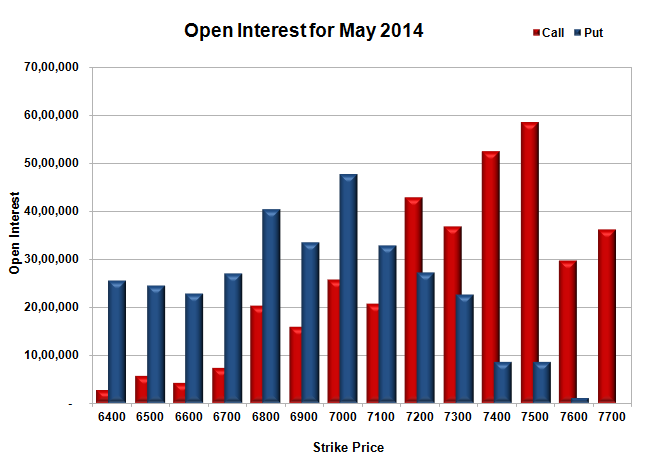 Initial support still at 7000, with OI of 26.33 lacs and below that at 6900 with OI of 24.17 lacs. Initial and very good resistance at 7200 with huge OI of 52.05 lacs and above that at 7500 with highest OI of 52.34 lacs. 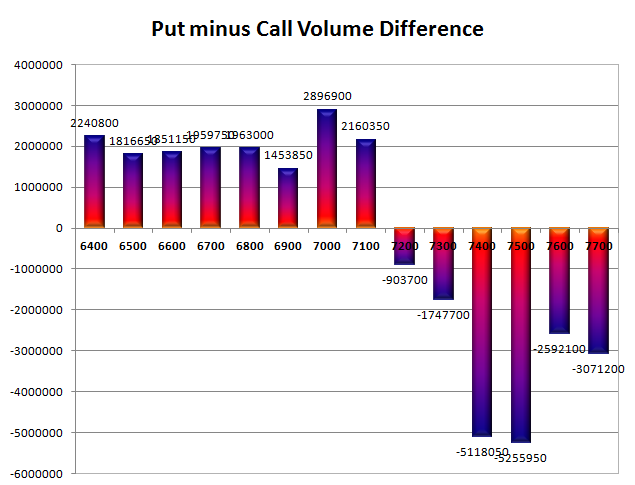 Day Range as per Option Table is 7034 - 7181 and as per VIX is 6988 - 7229 with 7111 as the Pivot.